It is mid-December all ready! Nic and I have been up to a lot these days, so let’s see if I can remember any of it, or in the right order. After leaving the sleepy beach town of Huanchaco, We made our way to the high mountains of Huarez, a nauseatingly curvy bus ride up to around 3000 meters. The busy city sits in a valley below some of the most stunning white capped peaks that seem straight out of a movie. In fact, rumor has it that one of the near by peaks was used in the Paramount Pictures opening sequence, where the stars fly around the tall peak, but we wouldn’t see that for a few days. After arriving early in the morning we found our hostal and rented a pair of bikes. Our hostal owner told us about a fun route, and rode with us to the collectivo that we needed to take up the hill. After 30 minutes we arrived and began to pedal high up the cresting hills, beyond where he suggested (I was following Nic, mind you) to a bridge across a small river. We ate lunch and took in the views, decided that we shouldn’t hike too far with the late afternoon timing and took off down the hill. Fighting off dogs and dodging all sorts of animals, we both flew past local homes and farms with colorful flowers and all sorts of vegetables and fruits. With it’s location relative to the mountains, it’s easy to see on our ride how the village was destroyed by a land slide, being directly in the crux of the sloping hills and sitting at the bottom of steep rocky cliffs. We made our way through town, asked a few times where we needed to ride to find our hostal and eventually made it back. That night we found our favorite restaurant, with a huge serving of Lomo Soltado (steak with an egg and french fries with rice) and ate our fill to prepare for our next adventure. Hiking down from Lago 69, a trail lined with carens to mark the trail. The next adventure, a hike to Lago 69, was a long bus ride to a high mountain lake, where we hiked with several other travelers to aother very high, very blue mountain lake at the base of a giant glacier. The glacier was perched high on the top of a mountain, stretching miles across and holding up the numerous waterfalls like stalkings from a fire place. The water and wind were cold, and the hike steep, but we shared a happy Thanksgiving with fun people from across the world, some of whom didn’t realize it was Thanksgiving, specifically the American couple who had just arrived in Peru. To their credit, they had just landed the day before after a day long flight, and traveling like that (not taking a day off) can really wear on the mind. 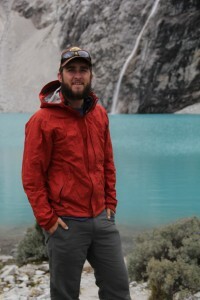 After returning to our hostal and vowing to do our research on the bus ride length of future treks we prepared for our trek to Santa Cruz, a three day backpacking trip that Nic and I would begin the next day. Little did we know, we drove up the exact same, 4 hour dirt road, past the Lago 69 trail head and well beyond. We chatted with the nice Peruvian gentleman beside us on the bus and were let off at a small tienda at the side of the road, after enduring a trecherous mountain pass in a bus much too large for the conditions. 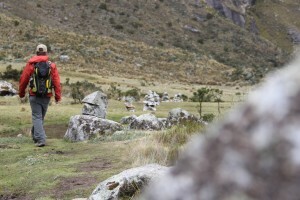 The trek was great, very little rain, beautiful scenery and amazing campsites. Nic and I had prepared with tuna and crackers for lunch, delicious pasta dishes for dinners and pourage and coffee for breakfasts. 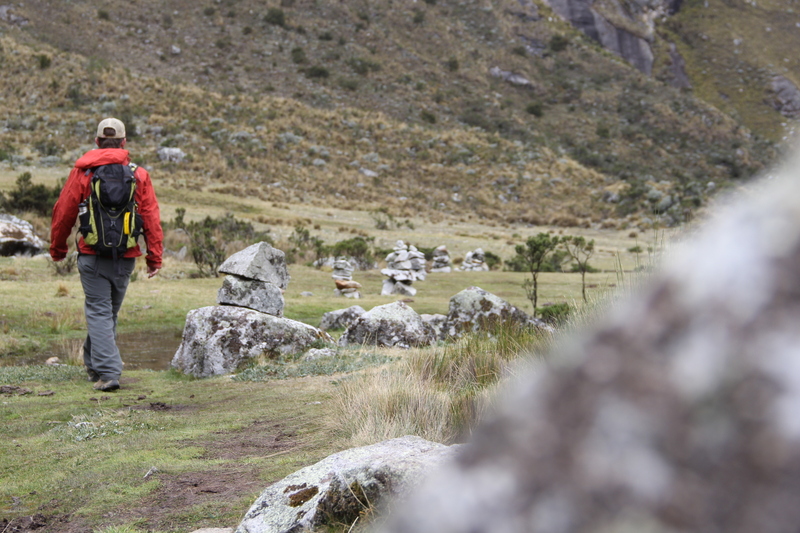 The second day we reached the high mountain pass at around 4500 meters and felt proud of our early morning hike. We made it to our second camp after hiking through a raging river that raveged the trail, and the next morning added an extra hike to another glacial lake before beginning the descent down. From this lake we had the best views I have seen since arriving in South America. Nic drew a great picture of the peak (which we assumed served as the Paramount peak I mentioned before) and we treasured the serenity that encompassed the valley. About an hour after we left the lake it began to rain, and with a long hike ahead we didn’t know what we were in for. After 5 more hours of hiking along-side a huge river, one of which kayakers dream of, we arrived soaking wet in the tiny town of Cashapampa. There were no collectivos, no taxis and no options for us to get back to Huarez that night. We walked along the road and saw a small family cooking chicken feet on the front porch of their tienda in the rain. They told us there was no way to make it back, and with darkness consuming us, we went in and bought a beer. One beer turned into three. The father approached us, and speaking in Ketchwa, offered us his back covered patio, where we could set up our tent and at least remain dry. His generosity raised our spirits, his wife cooked us some chicken feet, liver and rice which tasted like a Thanksgiving meal after being cold and wet, and we made our way inside our sleeping bags. The patio was barely large enough for our tent, and at the foot was a large, three story cage full of Cuy. Cuy, a Peruvian delicacy, are large guinea pigs. We still haven’t tried it, but it’s not because we haven’t tried. The chirping and scurring of the animals made it difficult to sleep, but it was sooo much better than what could have been. After saying our goodbyes to the three daughters of the family and thanking the father for his hospitality we hopped into our collectivo and headed back to Huarez. We recovered, with sore legs and damp clothes we booked our ticket to Lima on an overnight bus departing that night. No rest for the weary. That was the easiest bus ride we have endured. 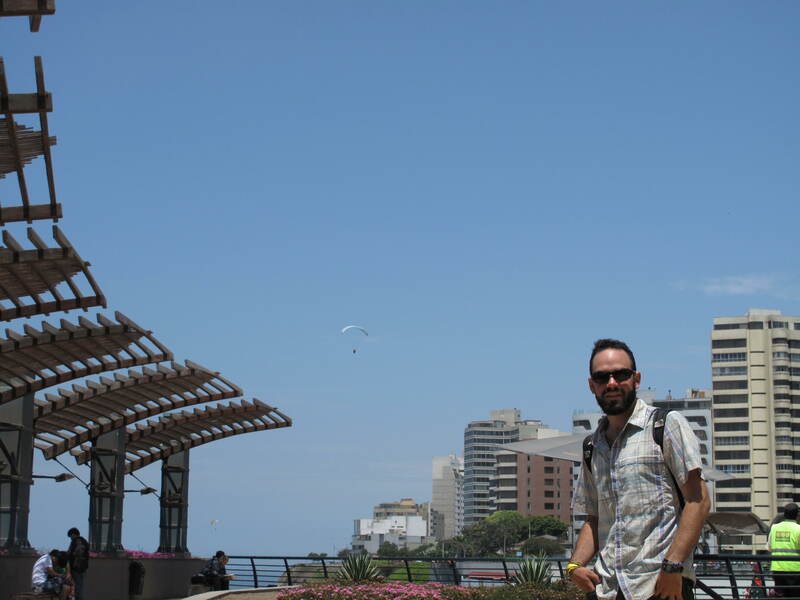 Lima, a booming metropolis, reminiscent of a town on the west coast of the US, was clean, bright and bustling with activity. It is situated on the Pacific coast, with millions of people and opportunities to visit historical museums and classical cathedrals. We walked around, tried genuine Pisco sours, with egg whites and all, and ventured into many cathedrals. We used the mass transit system, which we learned was brand new, and ate some great food, which was soothing after our ‘night with the Cuy’. Lima was an awesome change from the mountain scape we had left just days earlier. We met lots of people at our hostal, which is one of the many brands of Peruvian party hostals that fill with young, partying 20-somethings each night (also, a few creepy older people). 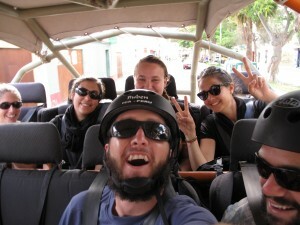 The crew as we tear out of Huacachina towards the dunes! Our next town, after getting our fill of busy city life and expensive drinks, was a small desert oasis called Huacachina. It lies outside of another town, Ica, and serves as a vacation spot for Peruvians from all over the country. It’s small, sandy and is wrapped around a small watering hole at the center. It’s extremely small, all of 98 citizens, and is filled with the loud, uninhibited sounds of muffler-less dune buggies carrying vacationers out into the desert. We relaxed, sand-boarded and eventually broke down to ride in the obnoxious vehicles. 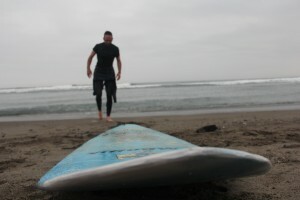 It ended up being wuite a trip, racing across the sand and riding on small, hand-made boards down gigantic dunes and seeing a desert sunset. We found our favorite pizza spot and then made plans for our exit, tired of the sand taking over our gear.